Either due to accidental trauma or tooth decay, it is possible for your teeth to suffer damage from time to time. At ConfiDenT, we offer a wide variety of treatment options to restore damaged teeth. For cases in which the tooth damage is too extensive for a dental filling but not large enough to warrant a dental crown, an inlay or onlay may be recommended. Inlays and onlays are effective restorations that are used on the chewing surfaces of the molars or back teeth. 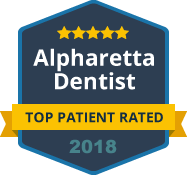 When choosing our Alpharetta dental practice for this restorative procedure, you can expect a rewarding experience and seamless results. Inlays and onlays provide substantial coverage for a damaged or decayed tooth, and they do not require the removal of additional healthy tooth structure around the damage. They fit precisely in the missing space, much like a puzzle. An inlay is designed to fit inside the tooth’s cusps, while an onlay provides protection that extends beyond the cusps of the affected tooth. After carefully evaluating your tooth damage, our Alpharetta dental team will explain which type of dental restoration you need. We will discuss what you can expect from the procedure itself as well as any long-term care of your inlay or onlay. At ConfiDenT, we are committed to addressing the unique needs and preferences of each patient. When it comes to inlays and onlays, this means offering several material options including porcelain, zirconia and even gold. Our dentists only use dental materials that are ranked superior in durability and effectiveness so that you get the very best out of your restorative dentistry investment. We work hard to ensure you leave our office with a restoration that is as comfortable as it is strong. Your smile is important to us. While we take extra measures to protect your smile from harm, we promise to utilize the latest treatments and techniques in modern dentistry to restore your teeth when damage occurs. Our dentists are equipped to care for your smile at all stages of life. If you have a damaged or decayed tooth, contact us today to schedule an appointment at ConfiDenT and learn if you may qualify for a dental onlay or inlay versus a full crown.